Hedgehogs have large ears and have an excellent sense of hearing, making them alert to their surroundings. Unfamiliar sounds or loud noises can cause hedgehogs to react by huffing and ducking their heads, in defense. Hedgehogs can become accustomed to a busy household, but it may take some time to get used to new surroundings. Providing continual background music to animals is quite beneficial, because it diminishes other, possibly disturbing sounds. 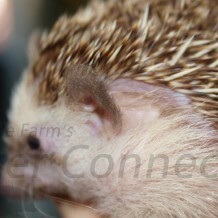 Hedgehogs are able to sense high pitched sounds that the human ear cannot. You must take into consideration, any electronic devices near your hedgehog, such as computer. These high-pitched sounds can be irritating to your hedgehog. Hedgehogs can and will become accustomed to your voice and sounds in its environment. Use this to your advantage in your handling and bonding process. When you get your hedgehog out of its cage, first tap on the side and talk to it for a moment. That will give your hedgehog advance notice of what you are preparing to do. At Millermeade Farms our hedgehogs all know the sound of their feed cart and most of them are ready and waiting at feeding time.